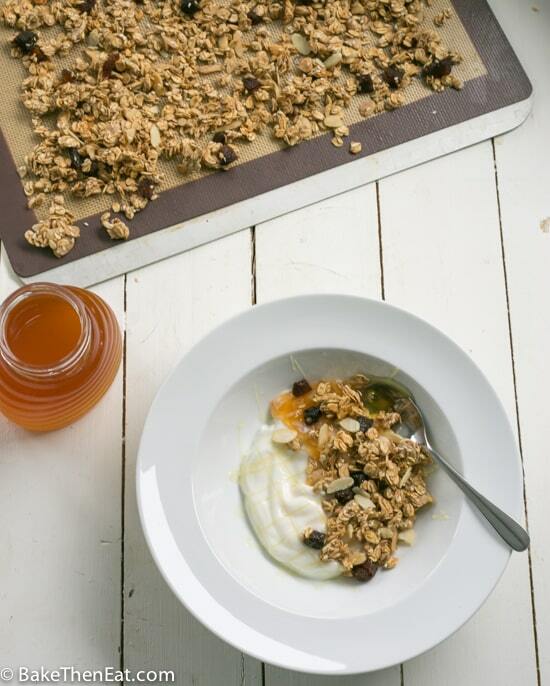 Hands up who likes a little crunchy granola in the morning? Or even as a cheeky snack at any time of the day? I know I do, but the real downside to granola is, how much sugar is in it. Shop bought granola is packed full of all kinds of hidden sugar not like this Easy Homemade Honey Almond Granola. The only sweetener is a little bit of honey and some semi-dried apricots. 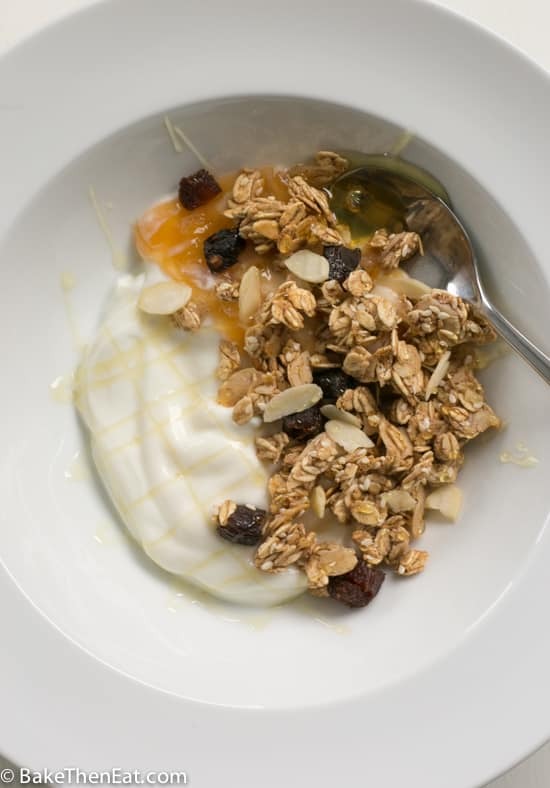 So read on to find out how to make this super easy homemade honey almond granola. 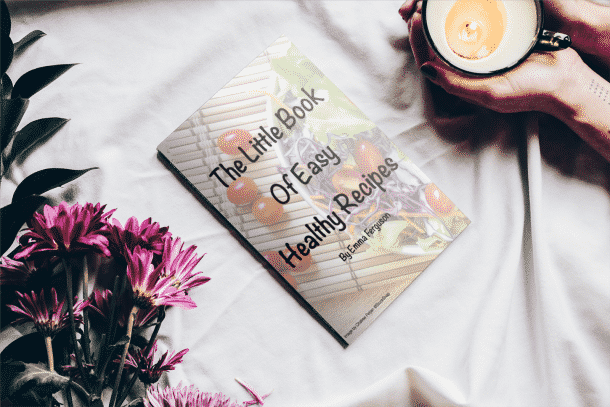 I have kept all refined sugars out of this recipe. Usually, I add a little brown sugar to my homemade granolas but this time I kept it out. Which does stop this granola from being too sweet. 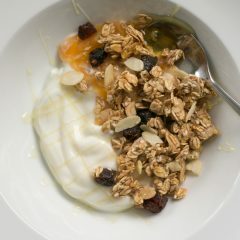 But the 2 tablespoons of honey help to give this easy homemade honey almond granola just the right amount of sweetness. And you can always add a little more on top if you wish. 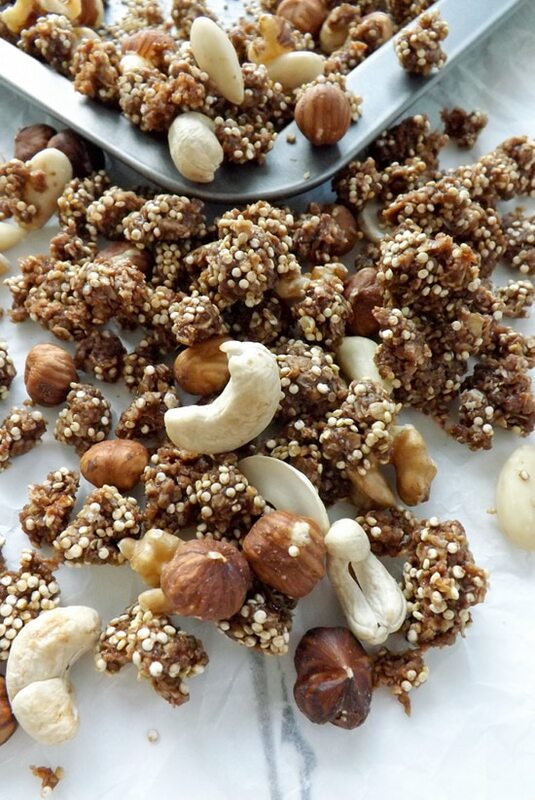 For crunch and to add some little heart-healthy natural fats I added in some flaked almonds. Almonds pair so well with honey and apricots, almost like natural bedfellows! To boost the almond flavour further I used almond extract, but in a pinch, if you don’t have any then feel free to use vanilla extract in its place. But I highly recommend using almond extract if you can. I also added a sprinkling of sesame seeds to the mix. They add a gentle sweet nuttiness to the overall flavour of this easy homemade honey almond granola and a little crunch too. To make it super crunchy and clumpy I added an egg white. This is made safe by baking in the oven, but if you have any concerns then please use ready pasteurised egg whites. So stop with the shop bought granola and make your own at home. 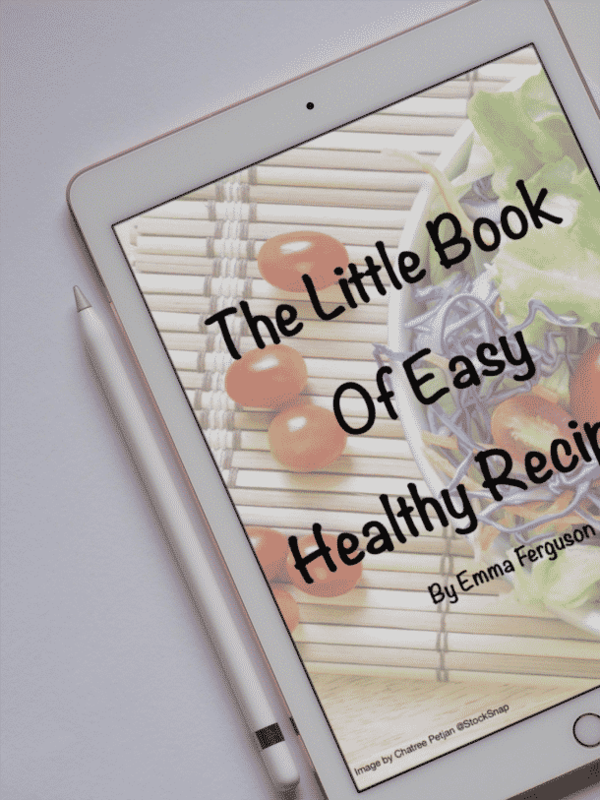 It’s super easy, it only takes a few ingredients and it’s far healthier than any shop bought granola you can buy for convenience. 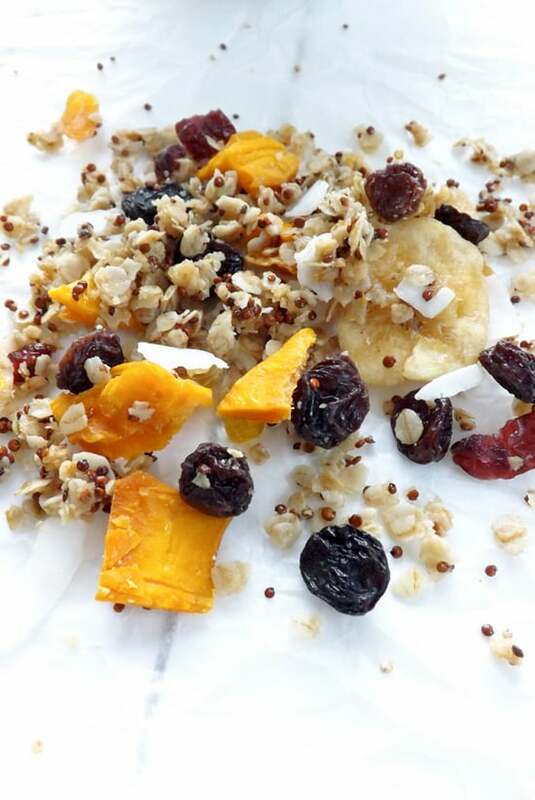 And you will really love this refined sugar free easy homemade almond honey granola. 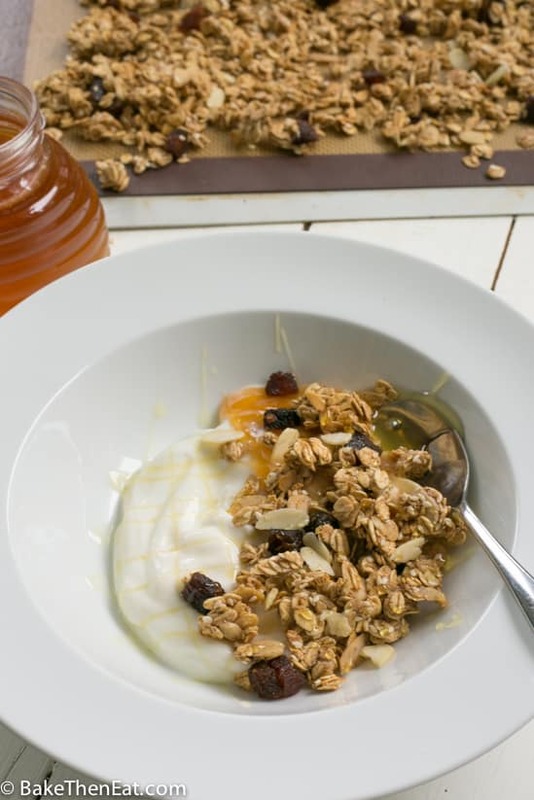 Easy Homemade Honey Almond Granola is a simple recipe to follow with no refined sugars. 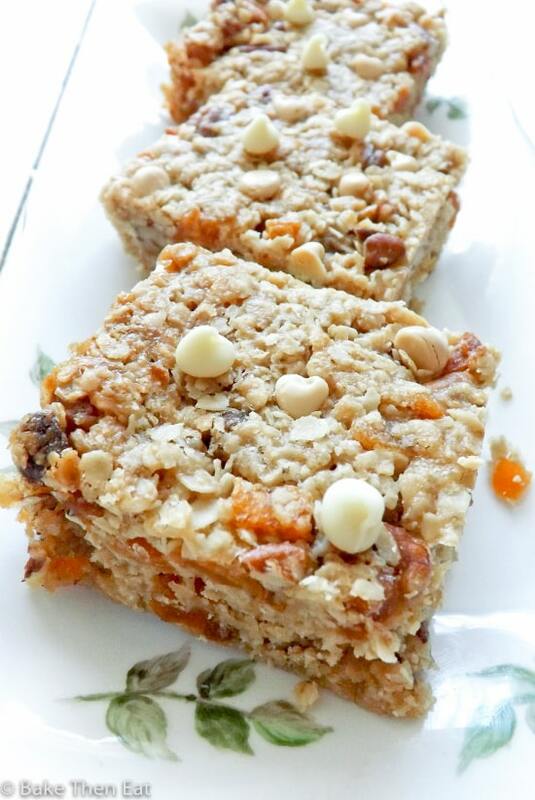 Sweetened with honey and flavoured with almonds and apricots. Preheat your oven to 150C / 300F / Gas mark 2 and line a large baking sheet with non-stick baking parchment or a large silicone mat. In a medium-sized mixing bowl mix the oats, sesame seeds, flaked almonds and cinnamon all together. In a small bowl, whisk the egg white until it is nice and foamy. Add the honey and almond extract and whisk them into the egg white. Add this to the oat mixture and mix well until all the oats are covered in the egg mixture. Stir in the diced apricots. 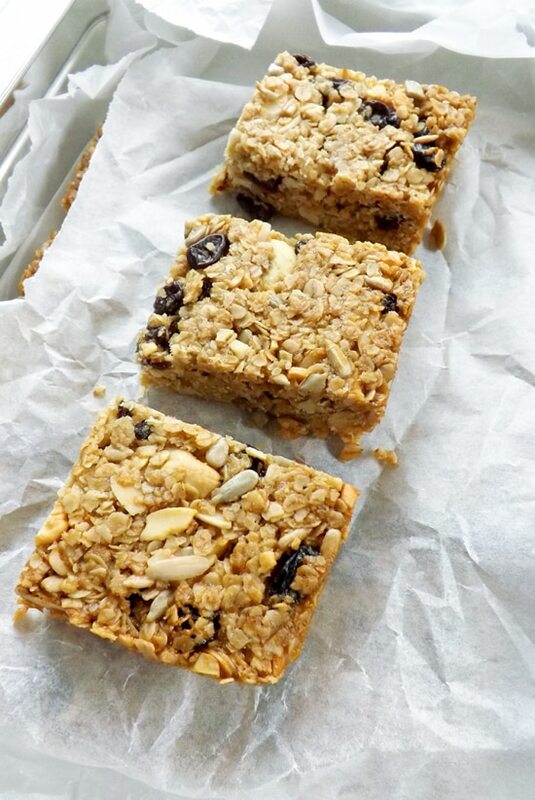 Sprinkle the oat mixture all over the baking sheet, keeping it all clumpy and pop it into your warm oven for 25 to 30 minutes until nice and golden. Stirring once halfway through. Store this easy homemade honey almond granola in an airtight container for up to 2 weeks. Beautiful granola. The only problem with making my own is that I can never stop eating it!!! I am completely the same Mimi 😀 Thank you. A perfect start to the day. I will have to try adding the egg white. Great idea! Thanks, Shauna. The egg white does make it super crunchy. Love homemade granola. So addicting. You have reminded us we need to get on this as we are all out. Love those little clusters on your cereal, but we love to eat it just as is as a snack to by the handful. Wishing you a super weekend. Sharing. Thank you, I must admit I tend to just eat it by the handful throughout the day. Its such an addictive snack! 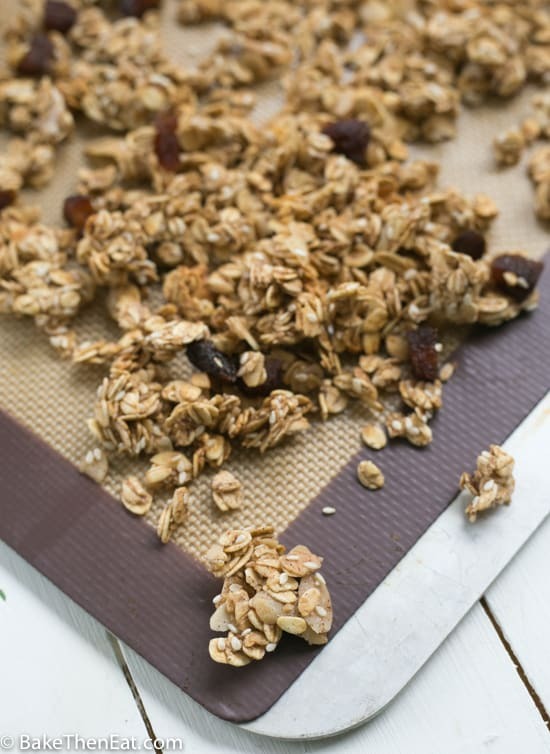 Always thought about making my own granola – this looks like a fantastic recipe I can’t believe how easy it is to make your own homemade granola! Have a nice weekend! 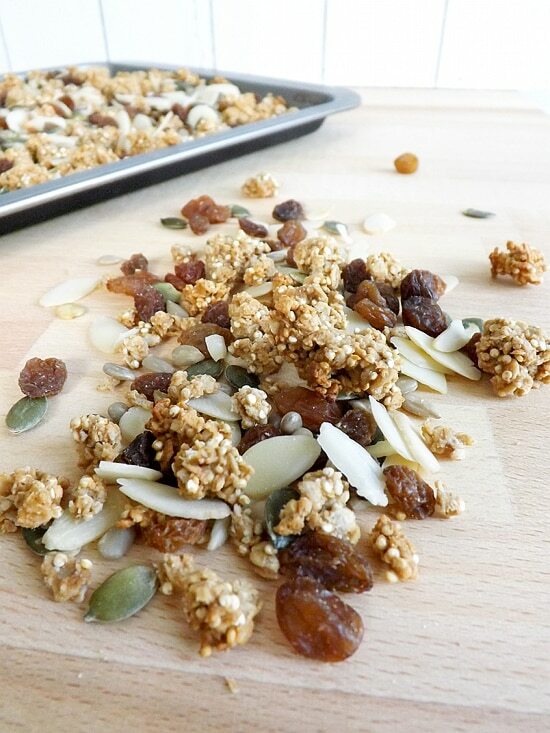 It is surprisingly easy to make your own granola Miriam. I am sure you would ace it! I love to snack on homemade granola! Yours looks super crunchy and great!